Thanks Thrash and please keep those recipes coming. Check out his blog. I had a whole fillet which I bought cheaply because it was ‘damaged’. It had been badly butchered and had bad cuts in all the wrong places. 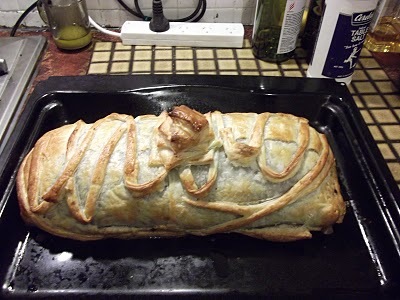 I decided to make a Beef Wellington out of it as I hadn’t made one for over a year and I had an experiment I wanted to try. The fillet had a classic taper down to a very thin point at one end so I folded it under itself to provide an even shape. 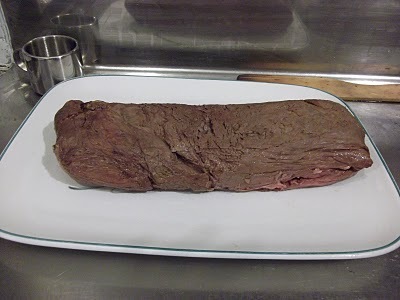 The fillet ended up being 35- 40cm long after being folded and compressed slightly in length. This fold and the damage to the fillet made it impossible to sear as if I had seared the meat it would never have held its shape. Instead I wrapped it very tightly in tinfoil and roasted in a 230 degree oven for around 15 – 20 minutes. It was then cooled and chilled in a fridge until required. The tinfoil used during the roasting and chilling process helps the fillet hold its shape after it is unwrapped which makes for easier handling during assembly. The next step was to make duxelles – finely chopped mushrooms, shallots/onion, herbs etc. sauteed and then cooked down to a paste. This involved chopping a lot of mushrooms. A LOT of mushrooms! Don’t ask me how many or the weight of them. I just kept chopping until it looked like I had enough. I’m a very casual cook when it comes to these things. I threw a bit of sherry in to the mix as well and added my experimental ingredient – about 200 grams of very finely chopped Harrington’s Black Pudding – near the end of cooking. Camille loathes black pudding. She can’t stand the texture of it and isn’t overly fond of the flavour either. I’m astounded by this and have a (mild) mission now. My aim is to introduce her to black pudding in other ways which disguise the texture and blend its flavour so it enhances other ingredients. Once the duxelles were cool I mixed them with a bit of pate which helps bind the mixture. This was then chilled. The next step was to spread my shop bought pastry sheets out and size them. I know I should make my own pastry but pastry is an unknown thing to me. I have never mastered making pastry and break into a sweat at the thought of it. The chilled duxelle/pate mix was spread over the pastry in a roughly even layer. Some was kept aside to place on top of the fillet to ensure it was properly covered. 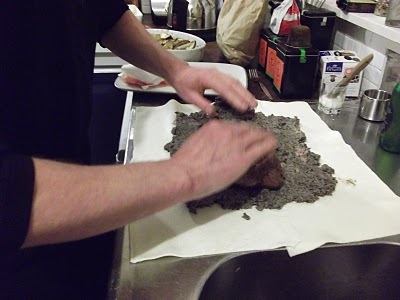 The fillet was placed on the duxelles and the remainder of the mixture was spread over the top. After being further trimmed to size, the pastry was folded over the top of the fillet and sealed – edges brushed with milk and pinched together. This gets a bit tricky as you don’t want to disturb the look of the dish too much. Thick, lumpy pastry seams aren’t attractive. 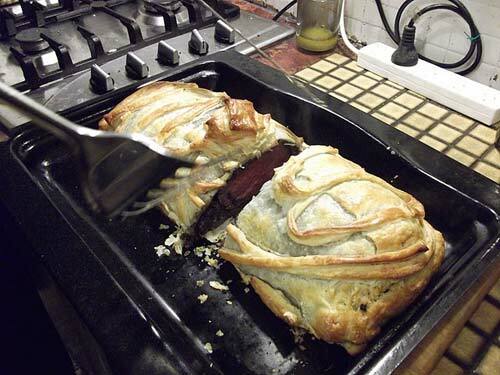 Once the Wellington was sealed I rolled it onto a flat roasting pan. Rolling is a very good option as attempting to lift a large Wellington is likely to end in disaster – at least if I’m doing it. More proficient people may be able to do this sort of thing. I am not going to go there though. My photographer completely failed to get a shot of the dish prior to it going in the oven! I had the oven pre-heated to between 210 and 220 degrees C. The fillet was given a quick brush with an egg beaten with a little water and then placed in the oven. Ideally it should stay in the oven until the pastry is golden brown all over. However, I was a little worried about the state of the fillet as I felt I had left it in the oven a bit too long earlier and didn’t want to over do it. This is where chilling the meat before wrapping it in pastry helps as it slows the cooking process. As you can see, the pastry is slightly underdone. Note the mad decorative bits made from left over pastry. Not the best decorations but it is a tradition in this household that any meaty pastry dish must be decorated. In the past Beef Wellingtons (and pies) have come out of the oven covered in flowers, names, hearts (on Camille’s birthday), odd geometric shapes, city scapes, vast scenic bas reliefs of well known mountain ranges and so on. My brother helped with the decoration and because we were hurrying a bit at this stage we limited ourselves to just throwing thin pastry strips topped with a pastry pile. Unfortunately one of the seams leaked slightly during the time in the oven and so the Wellington was stuck to the at one end. I wasn’t game to attempt remove it from the pan and onto a platter so it was sliced where it sat. The first cut: The fillet is just right (in my opinion) – just off rare. If I had left the dish in the oven any longer the beef would have been over done. The duxelles have slumped slightly so there is a bit of thick layer on the side of the beef. This is because I didn’t fold the pastry over quite tightly enough. It also probably wasn’t helped my rolling the fillet into the pan. Smaller fillets are much easier to manage! The black pudding gave the duxelles an extra depth. The dish had a much more ‘earthy’ flavour than it usually does. Spike (my brother) says it was great improvement as he finds the usual duxelle/pate paste to be a bit cloying, almost sweet in some peoples’ Beef Wellingtons. All who ate it enjoyed it, including Camille who exclaimed she couldn’t taste the black pudding. Blended flavours that enhance each other! That’s a success! Ready for carving, just off rare! You ought to be a part of a contest for one of thee finest websites on the web. I think you could have briefly put the whole thing under the broiler to get the pastry a bit browner without cooking the meat much more. Always a dilemma – especially if your beef is the centre part which is thinner – not to overcook beef/or undercook pastry! Your beef looked perfectly cooked though.